This is the perfect opportunity to see some of the most beautiful sites of Old Vienna and the modern city center. We will start off from the Greek Quarter (Griechenviertel), which is the perfect illustration of how Vienna looked centuries ago, when it was a small yet very busy and crowded trading hub on the Danube River. 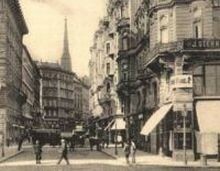 As a trade center it was a meeting place for many different ethnics and cultures, which can be seen in the architectural styles of this part of Vienna. We will then visit the Jesuit church, which is a fine example of the period after the Turkish influence over Europe was decreased in the 17th century. That’s when Vienna became an important financial center and lots of money was spent on building exquisite and expensive churches. St. Stephens Cathedral (Stephansdom) is another example from that period, depicting a distinct real-gothic style of the German speaking region. Of course, we will have a lunch break that will give you the chance to enjoy the famous Austrian cuisine in one of the many restaurants in the Old Vienna district. Vienna was the home and birthplace to many important personalities of different historic periods including Wolfgang Amadeus Mozart, Ludwig van Beethoven, Maria Theresia, Sigmund Freud and many others. And you will hear a lot of interesting stories about these celebrities as we’ll walk down the beautiful boulevards, courtyards and parks of Vienna. Another very important and famous part of Vienna is the Kaffehaus, which is considered by many locals as an institution of its own. This mix of typical café with artistic atmospheres and meetings of different creative personalities is considered as a distinct trait of this city. And don’t forget about the marvelous Imperial Palace, which is one of the largest buildings in Europe today. Its history spans over seven centuries and shows how it grew from a common castle into the center of the Habsburg administration. This place will show you how one of the most influential European royal family lived and how their rule was organized. Not to mention that the Palace is a very exquisite structure that will amaze and inspire you! Come with me on this walk through Vienna and you’ll fall in love with this city!